My father always wanted his own boat because he loved to go ocean fishing. He didn't live long enough to fulfill his dream, but he did get to go fishing on other people's boats. My dad was so happy when he came home from a day on Long Island Sound... so excited to share his catch with us. I would always ask him the same question: "Did you go out far?" And he would always reply, "Yes, we did." "So, you caught tuna, right?" I love tuna. I hate mackerel, and I hated the sight and the smell of my father gutting mackerel in the backyard. Mackerel can be a big fish, though not as big as a tuna. It's a bloody fish... my dad would have to hose the yard down for what seemed like hours to get rid of all the blood. It's also a smelly fish... a real fishy fish and we would have to eat it. so I would close my eyes and dream of tuna while I tried not to smell the mackerel I was eating. I guess you can surmise that I am a fan of tuna, and so are the rest of my family. Everyone was very happy to hear that I was making tuna for dinner. They assumed I was going to grill it, but I told them no, I will be slow cooking it... "Weird" with shrugs. Everyone in my family trusts Dorie's recipes. I didn't let on that I was a bit nervous about this one. I found this recipe confusing to read, and it didn't match up with other tuna confit recipes that I looked at on line. I just couldn't cook the tuna the way it was describe in the book. I had to organize and simplify the recipe in order to get my hands around it. My adaptation worked out well. My husband thought it was a great idea to cook something at a low heat in oven during the summer. It didn't heat up the house at all, and it was a nice change from slow cooker meals. Just a note, I did buy a can of olive tapenade to top the tuna, but all of us felt that it was over kill. The tuna had enough flavor and the tomato salsa (which was excellent) on the side with some dirty mashed potatoes was a well round taste experience for all us, a very satisfying meal. 1 small onion halved and sliced thin. 1) Whisk marinade ingredients together in a large bowl. 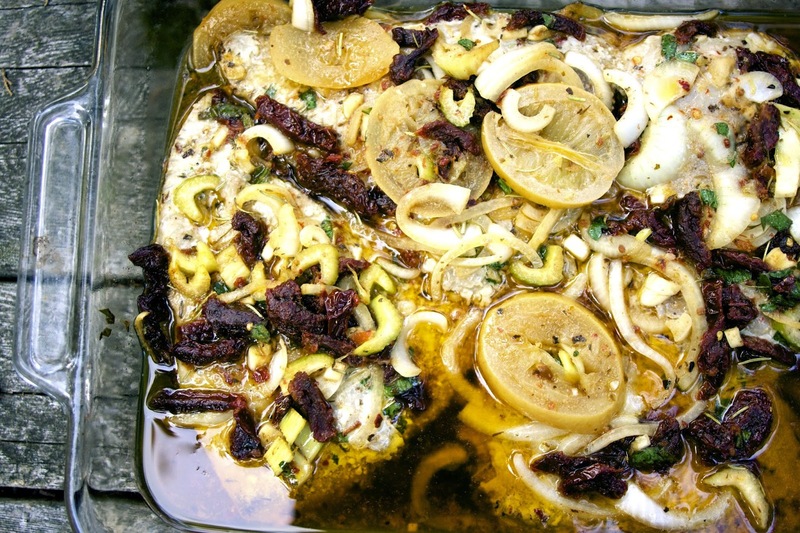 2) Stir into marinade: lemon slices, sun dried tomatoes, onion, celery and parsley. 3) In a gallon freezer bag put about 1/3 of the marinade. Lay 2 tuna steaks over the marinade. Pour about another 1/3 over those steaks. Put the last 2 steaks over the two that are in the bag and pour the rest of marinade over them. Lay the bag on a plate. Refrigerate for about 4 hours. 4)Pre-heat oven to 250 degrees. Rack in middle. 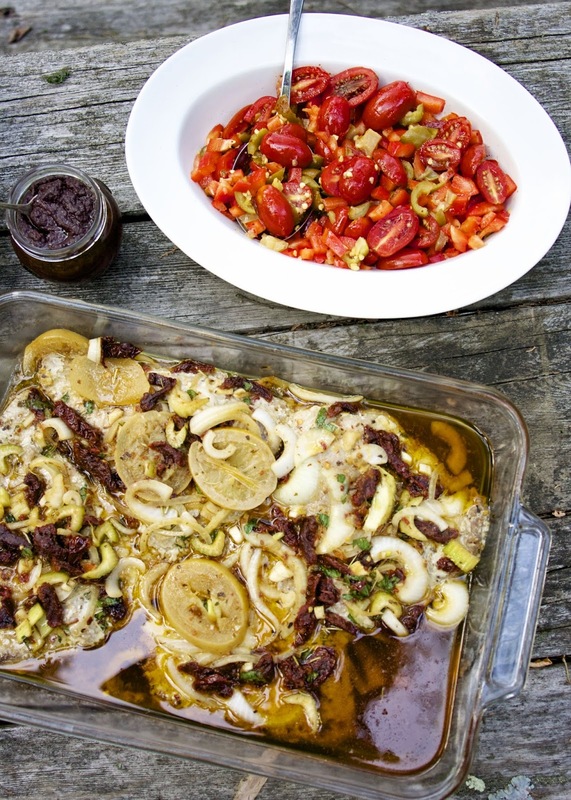 5) Transfer the tuna steaks and marinade into large baking pan. (I used a 9 inch pyrex) Spread lemon, onion, celery, tomatoes over the steaks. Cut out a piece of parchment to fit inside the pan. Tightly seal the pan with aluminum foil. 6) Bake for 40 minutes if you want it cooked through, if you still want it pink in the center start checking the steaks at 30 minutes. Serve warm or at room temperature. Delicious with a tomato salad or salsa. Dirty mashed potatoes or rice would also go nicely with this terrific summer meal. What are dirty mashed potatoes? They sound intriguing. I think you're right about the cooking time. Mine was not the least bit pink after an hour. 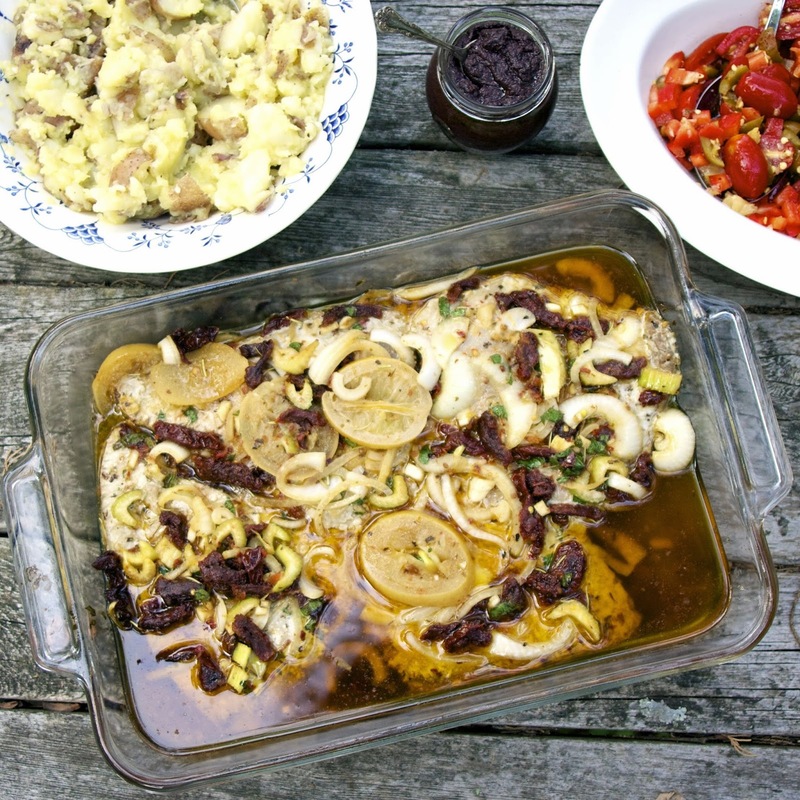 I'd like to try this again with a shorter cooking time...Great story about the mackerel. I've never tried it, and I'm not sure that I want to after reading your description. Yes, I don't recommend mackerel..ever. Dirty mash just means that you leave lumps. You can make it with butter or olive oil. Oh, yeah, and you don't peel the potatoes either. I loved the fact that this dish didn't heat up my kitchen! I have many memories of my grandmother pickling herring, and it's something that I can't even think about eating today. That smell lasted forever! I can image that herring has a similar fishy smell as mackerel. I like your adaptation. And I love lumpy mashed potatoes, so the dirty version sounds great. I actually don't mind mackerel, but my dad never went fishing, so I don't have those associations. Have a great weekend! Once mackerel is cooked it's not bad, but I would just smell my father cutting it and keep the association with the smell and....guts with me at dinner. I don't think I've ever had mackerel...so I'd always pick tuna if I had the choice. How nice of you and your siblings to eat it despite your true feelings. I like your cooking method...seems a bit more like what I'd expect! Kids were different back then. I couldn't image talking back to my father when I was little. I cook a lot of fish... I just needed to make the recipe more familiar. Glad you found a way to adapt this while still getting all the wonderful flavours. Yes, we all find our ways to work within these recipes. piece, next time for sure. If I made more I'm sure my teenage son would have eaten it, but I am so jealous of the folks who got to make salads with their leftovers. This was good and am glad most of us enjoyed this! Hmm, in my house growing up those were just called mashed potatoes. We never peeled them. My German husband was appalled by this idea when we first moved in together so now peeling the potatoes is his job. That's so funny about your husband being appalled. The skins are my favorite part of the potato. My dad came from a family of farmers. This meant that he brought home meat from a wide variety of places - I can remember learning how to help him clean fish when I was about five or six. I stayed away when it was time to dress the game that came home. Fortunately, we lived far enough away from the ocean that I didn't have to worry about the REALLY big fish. I liked how simple this recipe was - it was a nice alternative way to treat salmon. My kids learned how to clean fish from my husband. Lake fish are fine, it's the oily bloody ocean fish that make my stomach turn. Cleaning game wouldn't appeal to me either, though birds wouldn't bother me as much as deer and rabbits etc... I'm trying to face the reality of food. Thanks Tricia... I do love when food brings back a memory. I haven't thought about my father's fishing in 20 years. You always have great family stories to share:) I actually got the idea of using my leftover tomato salsa from a post you did on pasta with raw tomatoes. That's funny and I didn't think of making pasta with this leftover salsa. Your entire meal looks very good. I enjoyed your tale about your Dad and the mackerel. I always like reading your anecdotes about your family. By the way. What ever happened to the kangaroo? I actually made the tuna confit and even had it with mashed potatoes. Took the photos. They were bad. Even wrote half of my post. My tuna did not turn out as pink as I would have liked and, in the photos, the meat looked gray. So I bagged the whole thing and went with roasted shrimp salad. My tuna confit was tasty, however, just like yours, and I enjoyed it. I enjoyed the fish tacos that I had with the leftovers even more and will be writing about those, along with the roasted peppers this coming Friday. Bummer about your tuna, mine didn't come out pink because we don't like it that way. The wallaby was spotted pretty far from our area about a month ago. I think he is going to stay wild. What a delicious Mediterranean dish! Thanks so much for sharing your awesome recipe with Full Plate Thursday this week. Have a great weekend and come back real soon! Delicious Mediterranean dish. Yes some time we food for love rather than taste thanks for sharing your family story and tasty dish to Hearth and Soul blog hop pining. This looks delicious!! Thank you so much for linking up at Tasty Tuesday! Your recipe has been pinned to the Tasty Tuesday Pinterest board! Please join us again this week! Do you think I could make this with halibut instead of tuna? The recipe looks so good, but I don't like tuna. Thank you. I think swordfish is a bit meater, but you could use halibut.